Invented by skaters to capture the same skate-like ease on the slopes, skiboards will take you anywhere you choose to ride, on any terrain or under any conditions. Imagine fast turns like on skates, laying it down to the ground, backwards, forwards, spinning, dancing with a partner, riding deep powder, playing in the mogul fields and terrain parks. Skiboards convert the glade runs into a private skaters paradise, for nothing turns and stops like skiboards (except of course skates). Skaters typically master the slopes within one to 3 days depending on skating ability. 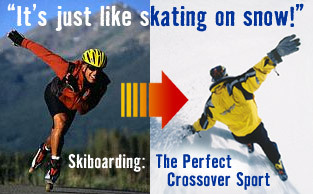 The balance and upright, relaxed stance you use on skates is identical to being on skiboards. Experience that sense of freedom on the slopes and fluid motion you’re already familiar with. No lessons, no poles, outrageous fun from day one and the freedom to go anywhere you desire in complete control. This is why so many skaters are becoming skiboarders. Finally, the perfect equipment for skaters to skate on snow! “By my third run, I was hooked. I was zipping around the mountain with a new confidence I’d never experienced on skis. Doc Roberts, President of Skiboards.com and skater for over 45 years!